Discover and RESOLVE the hidden causes of chronic conditions, emotional issues and persistent life problems. Regain control over your EMOTIONS, stop anxiety, anger, fear, guilt, grief or any negative emotions. Get peace with anything that’s happened in your PAST - yes anything that’s ever happened! Finally FORGIVE and move on with your life with newfound acceptance, wisdom and clarity. Improve all of your RELATIONSHIPS - including family, friends, colleagues and most importantly - yourself. Make more MONEY by clearing money blocks and using your mind as a powerful manifestation tool. Live a peaceful, purposeful and passionate, free from the toxic beliefs that have limited LIFE SUCCESS. Gain powerful and proven tools that give you the CONFIDENCE of knowing that you can deal with anything that life may bring in the future. Mind Detox is a remarkable method for resolving the unconscious mental toxicity that is causing countless physical, emotional and life problems. If something negative is happening in your body, emotions or life and you don't know why, then like thousands of others, this method can help you. Do you or anyone you know suffer from any of these conditions? Don’t miss this Mind Detox Masterclass! LEARN FROM THE WORLD’S LEADING EXPERT IN MIND DETOX… ME! I accidentally created the Mind Detox method in 2006 - when working as a therapist on a health detox retreat in Spain. Soon after I was invited to demonstrate the healing power of the method on 3 separate television series that were aired in 30+ countries. Following the televised retreats, I ran multiple Mind Body Detox Retreats internationally in Spain, Turkey, Thailand, UK and Australia. I first wrote about Mind Detox in ‘Peace for Life’ in 2011, then in ‘Heal the Hidden Cause’ in 2013 and now again in 2019. Third time lucky? I believe so, yes! Over the past decade and a half I’ve conducted hundreds of Mind Detox mentoring sessions with people from around the world and trained practitioners in the method from 20+ countries. Detoxing minds is what I do. After thousands of hours of 1:1 Mind Detox sessions, thousands of hours writing 3 books about the method, and the countless hours training Mind Detox Practitioners, it’s fair to call myself a genuine expert in using and teaching Mind Detox. With this Masterclass you will gain a unique understanding on your mind and how to harness its immense power to create lasting peace, positivity and success. "Sandy is the master of Mind Detox"
The Mind Detox Masterclass is based upon my brand new book - MIND DETOX. Including my newest insights from using Mind Detox with hundreds of people, along with many - never shared before - personal stories of how I’ve used Mind Detox in my own life to heal the hidden causes of anxiety, an eating disorder, insomnia, relationship issues and improve my personal impact and success. My simple 5-step system, with supporting tools, proves that by making peace with the past, your body becomes more able to heal. And by clearing toxic beliefs you are empowered to use your newly cleansed mind to achieve brilliant success in all areas of life. THE BEST NEWS… it’s easier than you may think! It doesn’t take years of therapy and no dwelling on painful memories is required. People from around the world have seen skin conditions clear up, chronic pain vanish and digestive disorders disappear, to name a few conditions, along with heightened levels of happiness, wealth and well-being. Mind Detox is the go-to-tool for living the best life! Stop treating symptoms, the belief-body-life bond, the cause of countless problems and resolving the root. The optimum state for using the method and the ten positive possibilities that are proven to purify minds. The 5-step Mind Detox Method, how to install positive possibilities into your body-mind and why it all works. Additional tools to use with Mind Detox, including how to use Tapping (E.F.T) more effectively, manifest your goals, improve relationships and live with peace - free from limitations. An opportunity to share how you’re getting on using Mind Detox, ask me questions and celebrate successes. ALL SESSIONS ARE RECORDED IF YOU CAN’T ATTEND LIVE. The live broadcasts are accessible from anywhere in the world. All you need is a computer or handheld device and an internet connection. 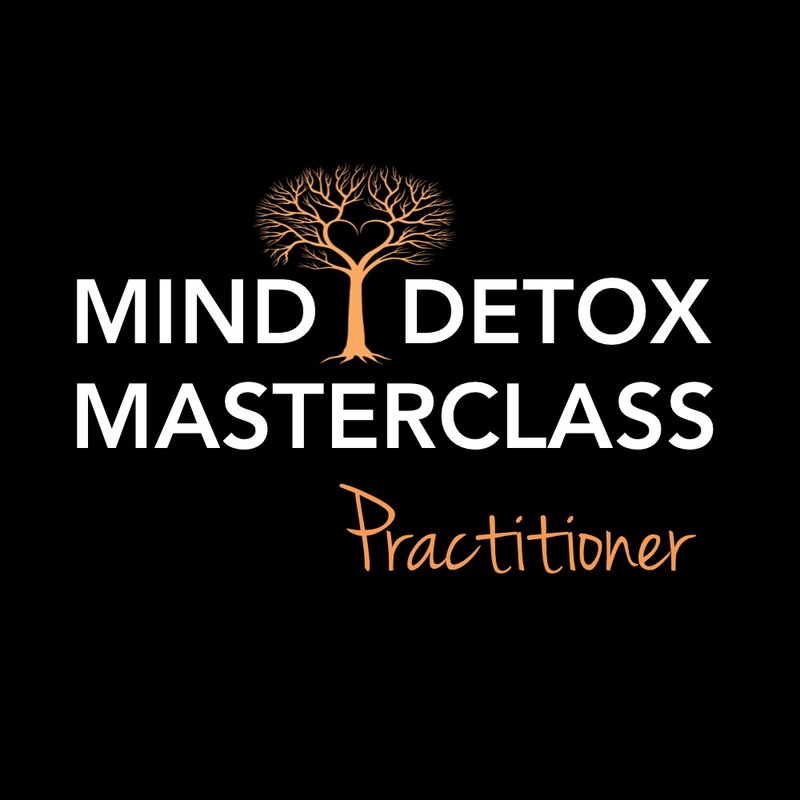 PRE-REGISTRATION INFO: We will email you the links you need to join the live webinars, download the Mind Detox Manual and join the Private Facebook Group - before 12th March 2019. The webinar recordings - both video and audio - will be made available if you can't attend live and so you can refer back to the course in the future. To register, click ‘ADD TO CART’ for your preferred option and pay THEN complete the registration form below. One Mind Detox Mentoring Session with me (normal cost is £297 - so you save £197). Limited availability - don’t delay! Mind Detox Practitioner Certificate - qualification enables you to offer Mind Detox Mentoring to your friends, family and paying clients. Choose this option if you want to dive deeper and benefit more from using Mind Detox, help others, make an income and a positive difference in the world. Please complete quick form this after making payment. Thank! Do you agree to our Policies, Terms and Conditions (which can be found at the bottom of this page). Thank you and congratulations for registering for my Mind Detox Masterclass. You will be very happy to have this technique in your toolkit for life. Please now confirm your registration by making payment below. IMPORTANT: Please also check your inbox for a MailChimp confirmation email - look in your junk folder in case it ends up in there! You need to click the link in that email to finalise your course registration. Doing so will enable us to email you the information you need to attend the course. Thanks and see you soon!